If you could simultaneously slash inventory, improve service levels, and speed up your supply chain, how far ahead of the competition would that put you? And imagine total visibility and end-to-end collaboration, in real time, on a single platform in the cloud. Find out how leading organizations such as Lockheed Martin, Argos UK, Sinopharm, the Rwandan Ministry of Health and the U.S. Marine Corps have done just that, and how you can too. Fill out the brief form for instant access to the complete Resource Library of supply chain strategies – it takes just 15 seconds and it’s free. 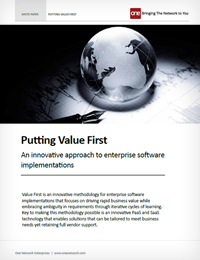 Putting Value First White Paper – Putting Value First – An innovative approach to enterprise software implementations. Learn how you can getting quicker, better ROI with much lower risk than with traditional implementations. Dana Case Study – How Dana, a global tier 1 supplier to automotive OEMs, exceeded expectations and more than doubled inventory reductions in their automotive supply chain. Automotive OEM – This case study explains how a major automotive OEM reduced transportation costs by 20% and improved service levels. What Makes One Network Different? – Find out exactly how One Network’s disruptive technology and business model means better, cheaper, faster solutions for you. One Network’s Real Time Value Network provides planning, execution and business intelligence solutions built on a federated cloud computing platform. With the Real Time Value Network, companies can plan, execute, and analyze their business on a single, multi-enterprise platform. Integrated Business Planning leverages the Real Time Value Network to link your organization’s multi-year strategic plan and annual operating plan, your monthly S&OP plans, and all operational plans. Compare your plans with what has actually happened or is currently happening, and even execute your plans across your operations and trading partners. One Network’s unique Sales and Operations Planning (S&OP) solution is built on the Real Time Value Network, enabling it to coordinate strategic and tactical planning across all internal operations and key trading partners, from the point of consumption to raw material suppliers. Achieve 30-45% reduction in days of supply inventory and greater than 99% store in stocks. Intelligent Demand uses a single integrated forecast that is enhanced and updated daily based on consumer sales. Benefits include reduced inventory (cost and days of supply), increased on-shelf availability, increased sales, and lower transportation and labor costs. Supply chain planning, execution, fulfillment and collaboration in one solution. Intelligent Supply is a multi-enterprise, many-to many solution that combines planning, execution, fulfillment, collaboration and business intelligence into a single cloud-based solution for companies and their entire supply network. How leading automotive drivetrain manufacturer Dana slashed inventory by over 30%, and gained five other major supply chain improvements. A case study on the African Healthcare Network operating nationwide in Rwanda, providing a secure, chain-of-custody, pharmaceutical network serving hospitals, clinics and the end patient. Arrow Electronics Lowers Costs and Improves Service with Automated Replenishment from One Network. United States Marine Corps Achieves Total Asset Visibility and Automates Flow of Ammunition to Warfighters Worldwide. How companies can generate highly accurate short-term demand signals, and meet consumer demand while driving the lowest cost possible across their distribution, manufacturing, and procurement activities. One Network, reveals how its partners and customers are leveraging One Network’s cloud platform to build, modify, and extend innovative multiparty applications. This webinar features case studies from the US DOD and the healthcare industry. Global logistics provider Resolve, reveals how they build nimble and agile supply chain with total visibility for their customers. A discussion with Alain Poirier of Tompkins International and Mark Zelenak of One Network on just what a Control Tower is, what it can do and what it can’t do. Of special interest are the five best practices to consider when selecting supply chain technology. What is multi-tier supplier collaboration, and what can it do for you? Shirell James discusses ONE’s unique Intelligent Supply solution, how it works and the benefits it offers. Dissects the problems with traditional hierarchical supply chain planning and argues for a new framework that supports near term execution as well as long term planning. IS YOUR SUPPLY NETWORK REALLY SHELF-CONNECTED? How to identify, and achieve, a truly shelf-connected enterprise. This paper explains a new approach to forecasting, replenishment, collaboration, and S&OP. How to use a highly accurate forecast of near-term demand to drive up perfect orders while lowering inventory levels. This paper discusses in depth, the top opportunities that 3PLs and 4PLs can take advantage of, radically increasing the value they provide their customers, and making them a kingpin in the supply chain. Learn the real power of Distributed Order Management (DOM), a system that aggregates orders from multiple order capture channels and provides a single source of information across these channels. This paper clearly explains the advantages of DOM, and how it can propel your business ahead of the competition.